Michigan-born percussive dancer Nic Gareiss and Edinburgh harpist Maeve Gilchrist met while teaching at the Shasta Fiddle Summit in Northern California. They continued their musical relationship with spontaneous collaborations at festivals and chance meetings and later toured together as part of Darol Anger's band, 'The Furies,' finally making their duo debut at the Celtic Connections festival in Glasgow, Scotland. 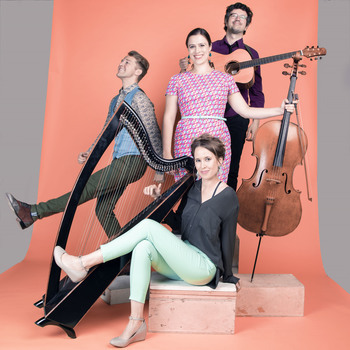 Sharing a deep respect for traditional music and culture while drawing on contemporary elements of music, movement, rhythm and improvisation, Nic and Maeve have emerged from the vibrant new acoustic scene as innovators in their fields. The percussion and drive of Nic's footwork, combined with Maeve's melodic and improvisational sensibilities, make for an explosive duet sure to delight both the ears and the eyes. Montrealer Yann Falquet is one of the most creative acoustic guitarists in today's Québécois music scene. Over the last 15 years, he has recorded five albums and toured the world with French Canadian power trio Genticorum. Over the years, he has developed a unique personal guitar style for Québécois folk music, rhythmically powerful yet subtly complex. In the last few years, this husband and wife team of Natalie Haas and Yann Falquet have been touring together as a duo, performing a mix of Québécois traditional songs and new takes on folk music from throughout Western Europe.